It's the semi-finals of the MTN8! 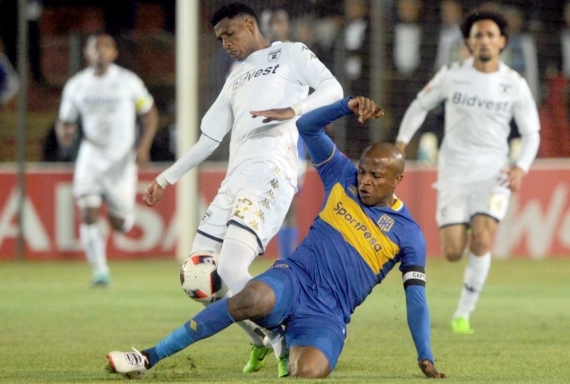 Cape Town City host Wits, while SuperSport do battle with Maritzburg. Four teams have booked their spot in the MTN8 semi-finals and the two-legged encounters are kicking off this weekend. Maritzburg United shockingly eliminated last season’s runners up, Mamelodi Sundowns, while the defending champions, Bidvest Wits, managed a penalty-shootout victory over Golden Arrows in a match that finished 2-2 but the result was rapidly overshadowed by seven red cards and two penalties during regulation time. More drama and shock results surely await in the penultimate stage; let’s predict what’s in store. SuperSport United players don’t seem to have adapted quickly to Eric Tinkler’s tactics as they managed a nervy 1-0 victory over Kaizer Chiefs in a nail-biting contest to reach this stage of the tournament. The team then lost 2-0 to Mamelodi Sundowns in the league this past weekend in a match where they were totally dominated. It is also interesting to note that they have all the tough encounters at the start of the season as they will play Chiefs in the league on Wednesday evening before this MTN8 fixture. They will have the suspended Dean Furman back for the semi-final as he will sit out the Chiefs match due to the red card he received against Sundowns. Fadlu Davids has been given the coaching role permanently at Maritzburg United and he seems to be doing something amazing. Over his first two games, he has an immaculate record, having earned a hard-fought 1-0 win away to Mamelodi Sundowns in the MTN8. He then went to the Royal Bafokeng Sports Palace and beat Platinum Stars 2-0. The addition of Siyanda Xulu has given The Team of Choice the much-needed depth defensively as he came on for the injured Dennis Wiedliech in the recent encounter and rose to the occasion. Deolin Mekoa, Lebohang Mabo end Evans Rusike form a dangerous trio upfront and they will create all sorts of problems for the SuperSport defence. I’m backing SuperSport United to just edge this one. After going toe-to-toe in the Premier Soccer League opener, The Citizens once again face off against The Clever Boys in a mouth-watering encounter that will see Benni McCarthy’s charges looking to get the better of the defending champions once again, this time, in a knockout tournament. At the time of writing, McCarthy’s two-match record since he took over the coaching reins at Cape Town City remains at 100% after he recorded two 1-0 victories over Polokwane City and Bidvest Wits. City haven’t played convincingly, but they’ve always managed to get the job done. The side that only came into existence last season, after buying Mpumalanga Black Aces out of the PSL, have faced Wits five times so far, winning twice, losing once and registering two draws. It’s very interesting to note that their only defeat at the hands of Wits was the first leg at this stage of this very tournament. Contrary to popular belief, Wits’ campaign hasn’t kicked off with a bang. They lost 1-0 in the league against City, and to reach this stage of the MTN8, they scraped to a 4-3 penalty shootout win over Golden Arrows after coming back from 2-0 down to salvage a 2-2 draw. Blending new signings with last season’s championship winning side seems to be giving Gavin Hunt a selection headache as the team continues to play disjointed football, and in my opinion, leaving Xola Mlambo out of the team over the first two matches has been his biggest mistake. Hunt, alongside his assistant, will watch from the stands once again as this will be the final game of their two match-ban for the red cards they received against Arrows. That will leave goalkeeper coach, Paul Johnstone, having to dish out instructions on the sidelines. Both teams will be very cautious in their approach to the game. Back the draw here at 21/10.